Located in southern France in the heart of the countryside, close to some of the country's most beautiful national parks and protected areas, Barjac is a nature lover's paradise. A visit to this picturesque region offers plenty of outdoor activities, such as fishing, cycling, and canoeing or kayaking, as well as stunning surroundings and pretty, traditional buildings in the town itself. 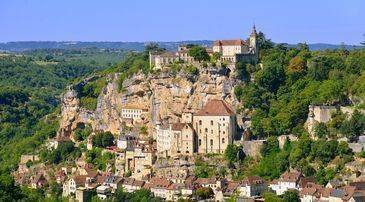 This small Renaissance town is ideal as a base for exploring this area of France. Nimes is just over an hour away by car and the small rural villages of Vallon Pont d'Arc, Saint Ambroix and Goudargues are within easy driving distance as well. Madame Vacances offers comfortable accommodation in this area, with beautiful buildings matching the rural location of the town. From here guests can enjoy the many water-based activities and sports on the river. As the sun sets on a day of activities, spend downtime wandering through the narrow streets of the town, enjoying the delicious cuisine from the quaint restaurants and locally run shops which are found dotted throughout. Most of the activities in Barjac are based around its river, where guests can enjoy swimming in the calm, clear waters or take part in the water sports and activities available. 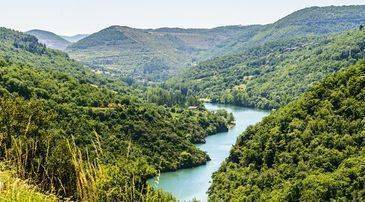 Kayaking and canoeing are popular on the river, and its soft beaches are ideal for relaxing as you soak in the warm sunshine of France's summer along the tree-lined banks. Those travelling with the family will also find high adrenaline activities to take part in, including a paintball facility just a five-minute drive away. The architecture of the town is ideal for lovers of history and culture, and can be easily explored on foot. Built using the traditional stone of the area, each building is unique, with the main square encompassing the heart of the town, home to a picturesque water fountain and plenty of character. Every August this medieval town hosts its renowned three-day antique fair which tourists and locals flock from far and wide to visit. Taking place since 1974, the market is held in the open air and offers visitors the chance to browse unique and rare pieces of art, furniture, clothing, jewellery and more. Chat with the friendly locals who will help you find what you need, and make sure to bring cash as credit cards aren't accepted. Barjac is surrounded by scented lavender fields ideal for hikers and cyclists, as well as trails along the river and up into the hills and mountains. There's a wide range of options, from easy routes that children can enjoy to tricky steep inclines. 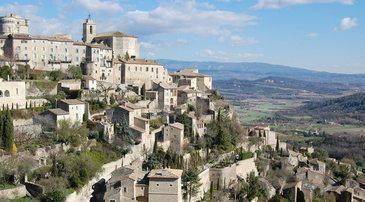 Enjoy the forests, interesting rock formations and views over the farmlands and valleys below, where you'll happen across olive groves, vineyards, and waterfalls. Alternatively, animal lovers will enjoy the horse riding treks available from the nearby towns, with the local riding schools matching you with the right horse and taking you through the best trails. Barjac is a rural village set within the countryside and is surrounded by a number of pretty, quaint towns to explore nearby, as well as some larger cities such as historical Nimes. Visitors are advised to hire a car due of the town's rural location, with car rental companies available at all of the nearby airports. Montpellier is just over two hours away, and is often overlooked by tourists in favour of the larger local cities such as Nice and Marseille, giving it a peaceful atmosphere. Filled with history, museums, galleries and even an aquarium, the city is the capital of the Languedoc-Roussillon region and makes for a great day out. Nimes is also just over an hour away and is ideal for those with a passion for the ancient, with buildings and monuments dating back to the Roman era. The Maison Carree is a Roman Temple with interesting remains and artefacts, but the Arena of Nimes is the star attraction. This huge structure is built in a circle and is thought to be where plays and gladiator fights were performed when it was originally built. Other sites not to be missed are the Pont du Gard, a three-tiered Roman aqueduct in almost perfect condition; the Caree d'Art gallery; and Nimes Cathedral which is built in an elegant traditional French style. Barjac is home to a long tradition of farming in the area, and incorporates fresh ingredients from the landscape, including cheeses, wines, meats and vegetables. Splash out and enjoy the delicate local truffles mixed with succulent vegetables and sauces or try the free range beef dishes, with rich French sauces. Although a small town, Barjac is home to plenty of restaurants for visitors to choose from. Le Monteil is found in a typical shuttered building and offers hearty soups, melting chocolate puddings, tender beef and a fantastic choice of wines. Buzz has a more casual vibe, famous for its rich burgers packed full of ingredients, as well as meaty salads, and cheese and bread boards. Le Vieux Clocher offers a more modern dining experience with locally cured meats and salads served in a pretty courtyard surrounded by lush greenery. And Nature & Thé prides itself on locally produced goods, with plenty of vegetarian options, including falafels, houmous, and lentils as well as local meat dishes. Ideal for groups and those who wish to treat themselves to a tasting menu, La Cave d'Ernest is perfect. Well known in the area for its creamy cheese boards and positioning itself as a 'cheese bar', the quality café offers much more including charcuterie, dips and pastas. The nightlife in Barjac is generally quieter than the larger nearby towns, but offers bars and clubs with delicious local French wines on offer, as well as ciders, beer and some cocktails. There are a few places that boast a dance floor, and most of the restaurants also stay open until late. There are a number of services in Barjac which offer a bilingual babysitting service, or alternatively, a list of trusted local childcare providers, with nannies and au pairs is also available. Madame Vacances' Résidence La Closerie offers free parking on site, making it easy to explore the local region. There is also limited free parking available on the streets within the town.